This Saturday – Have a Happy Vegan Pizza Day!! It’s Vegan Pizza Day on the 28th, which means I am obliged to spend all day, (and maybe weekend) sampling and creating as much vegan pizza as I can lay my hands on! It feels like today is the perfect chance to blog about how easily available tasty vegan pizza is. If you do your research, there are so many places that can do you a vegan friendly option, perfect if you are a newbie vegan like me and out dining with omnivores! I’ve riffled through my photos on the laptop and my phone for a few snaps of the vegan pizzas I’ve had out and about, so you can see some sort of example of what you get. A few places I have visited before that are happy to accommodate a vegan option include; ASK, Pizza Hut, Prezzo and Zizzi. These guys all have at least one vegan pizza base & tomato sauce. Just ask them to leave off the cheese and swap it for extra veggies. Before I go, I have a quick scan of the allergy information sheets (just google it & the restaurant name) so I have it clear in my mind what I am asking for. Pizza Express have recently added onto their menu a vegan pizza, The Pianta! It’s got a spicy Arrabbiata base, topped with spinach, chestnut mushrooms, pine kernels and artichokes. It’s super yummy and the spice makes a nice change from my usual tomato sauce and veggie combo. Pizza Express have always been a great option for me even before they brought the Pianta out, they are happy to change any of the pizzas to make them veganised, and you can even have your own vegan cheese added on top, provided you bring it in its sealed, dated packaging. 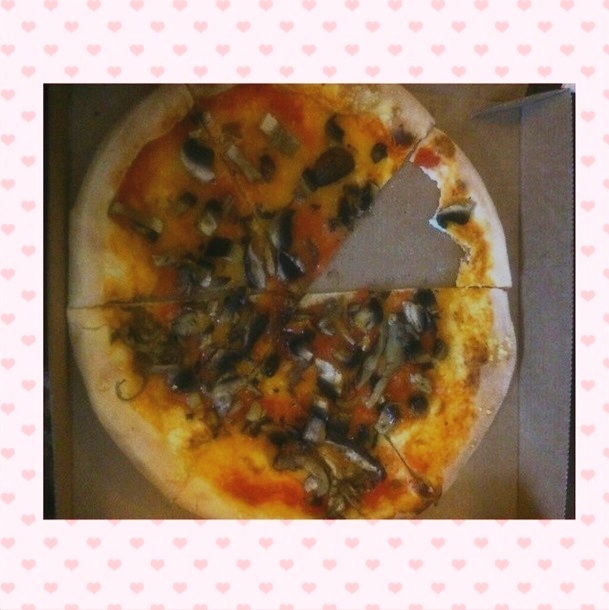 I rate Mozzarisella cheese for pizza, click the link for my review! 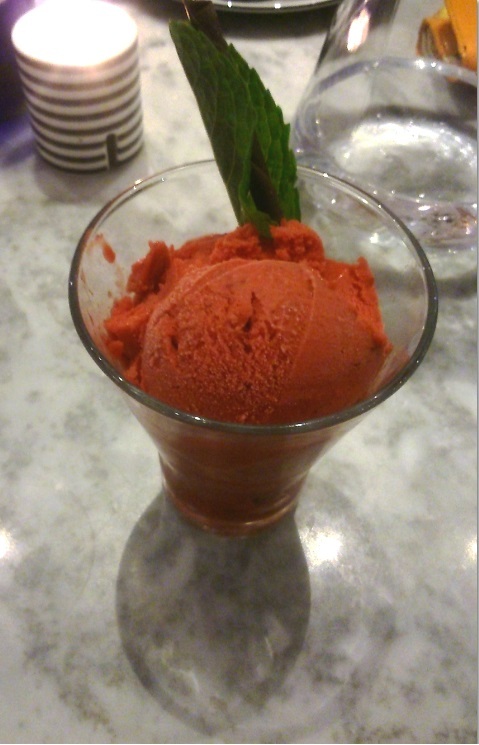 Here’s some snaps from when I had the Pianta in April 2014, followed by the delicious Raspberry Sorbet. The Pianta in its full glory..
I’ve also had a vegan version of the “Superfood Salad” which was absolutely massive, and felt very healthy and nutritious. 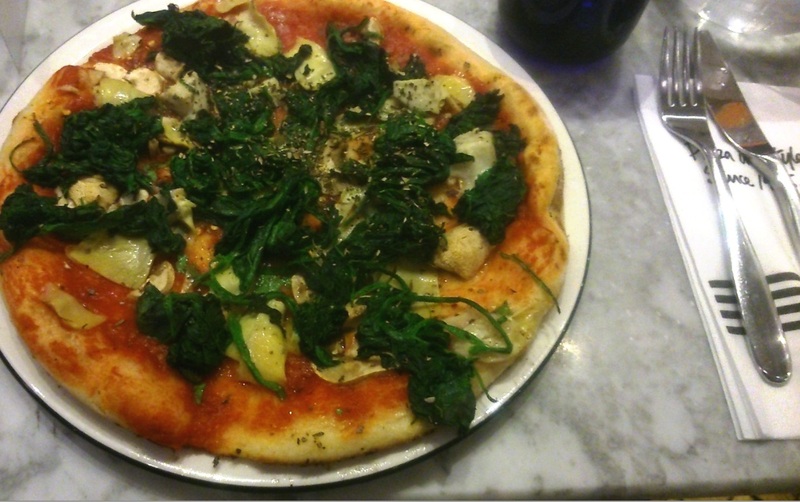 Read up on the vegan options with Pizza Express here. I had this last month, and was so excited to try it, as there’s lots of hype about this place online. They have vegan Mondays and Tuesdays, with 4 special vegan pizzas, including ones with vegan sour cream, vegan pepperoni, vegan sausage and all the other traditional toppings vegan-style. They also cater for all different dietary requirements, with spelt bases and other GF options. If you are ordering on a different night, as I did, you can still get a veggie pizza, as vegan cheese is available all week. I ordered the Funghi- Field, shiitake, chestnut and oyster mushrooms topped with garlic, Parmesan, thyme and truffle oil and vegan cheese. It was a great size for the price. I also got a huge vegan garlic bread too, because naturally the choice of side with pizza is yet more bread, right? Whilst it was quite nice, I did feel a bit disappointed. I don’t know if it was the potentially strong taste of the garlic & truffle oil, or it was the vegan cheese – or maybe all of it combined, but there was a strong flavour I wasn’t that much of a fan of, and I couldn’t put my finger on it. I’m not sure which brand of cheese they use, so it could be that, as I find there’s only a few vegan cheeses I am happy to eat. 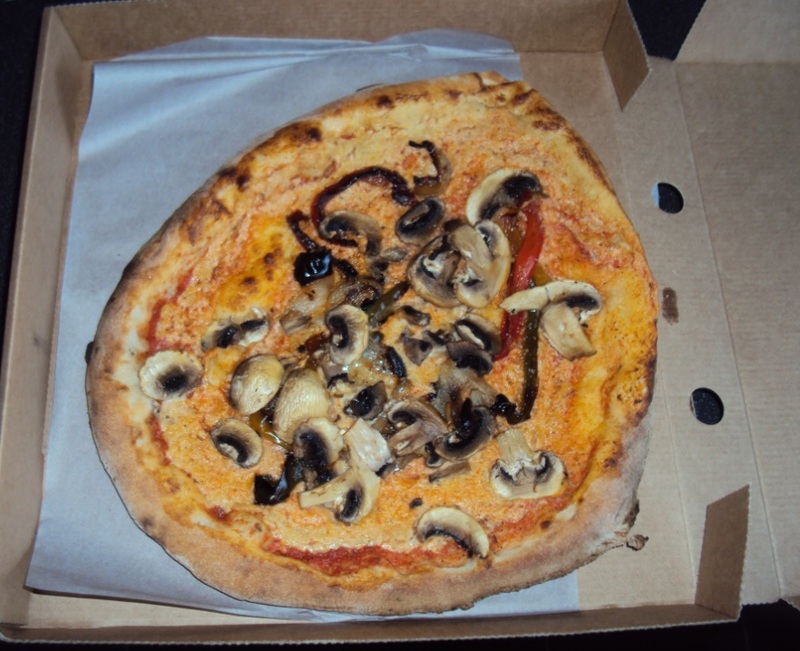 So whilst it was awesome to be able to order a vegan pizza with vegan cheese after all – it might be better to just order extra veggies next time- or try again on a Monday or Tuesday night and have one of the vegan specials. Sorry it’s not great quality. I may have been a bit distracted by the Champagne that went with the pizza that night (!) 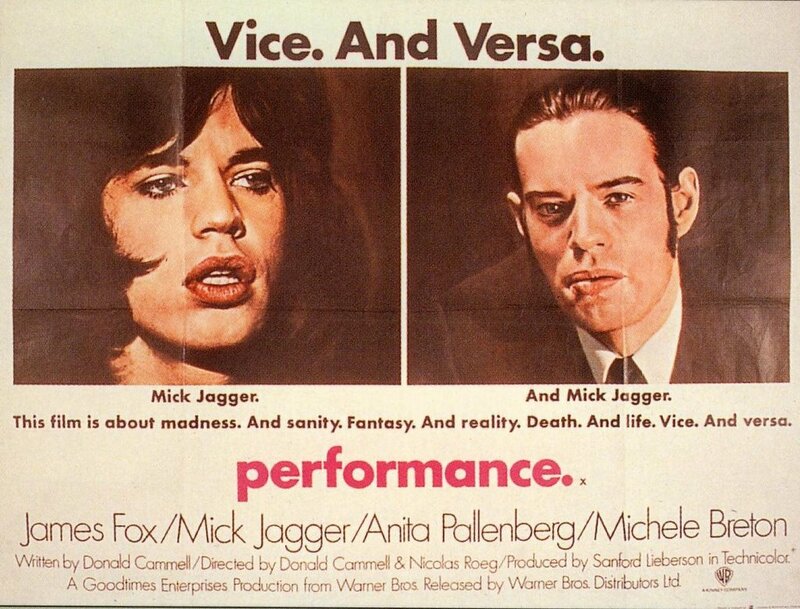 and we were also watching Performance in the dark that evening! However- I did make a heart shape with it! This little place has always interested me, I remember visiting before it had been set up yet, above the bus station. Then I walked past it once it was more established, selling pastries on ground level in the day time and I saw those exciting words: “VEGAN CHEESE” I am always excited and surprised when I see vegan options advertised outside of Brighton, but it is so fantastic to see that it is something more places are offering, and it looks as though demand is increasing.. I popped in again one night to ask what brand of cheese they are using- turns out they have a local supplier of cashew cheese – my gosh I knew right then, the next opportunity I had I would be buying a LARGE vegan pizza from them. 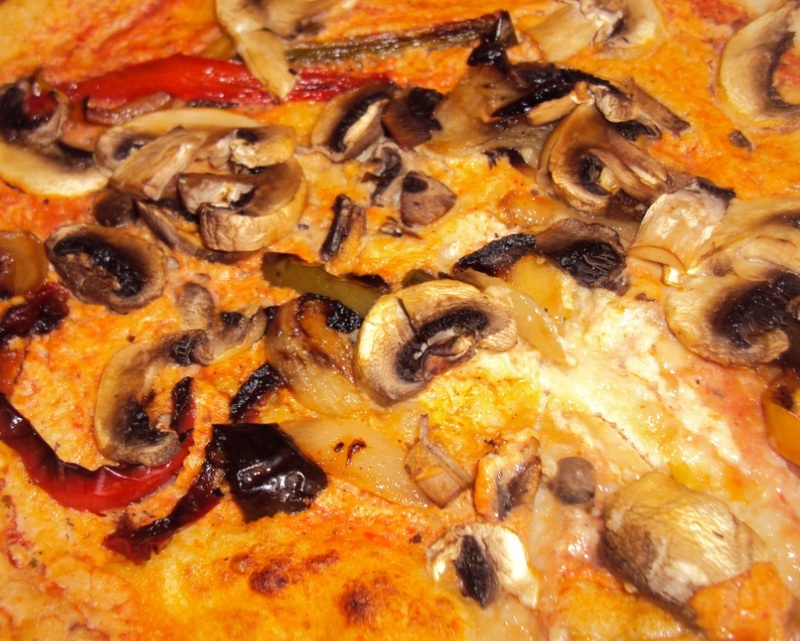 So last weekend – Mushrooms, peppers, caramelised onion and lots and lots of cashew cheese! Best Vegan Pizza yet – oodles of delicious creamy cashew cheese, and delicious base, all cooked on the spot, in less than 10 mins! It was also huge and only £8.45. Even shared some with my non vegan niece, and it got the nod of approval from her. The side of choice! 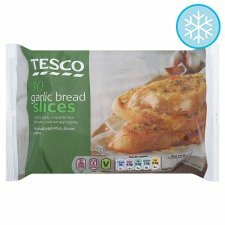 Vegan friendly garlic bread slices from Tesco. 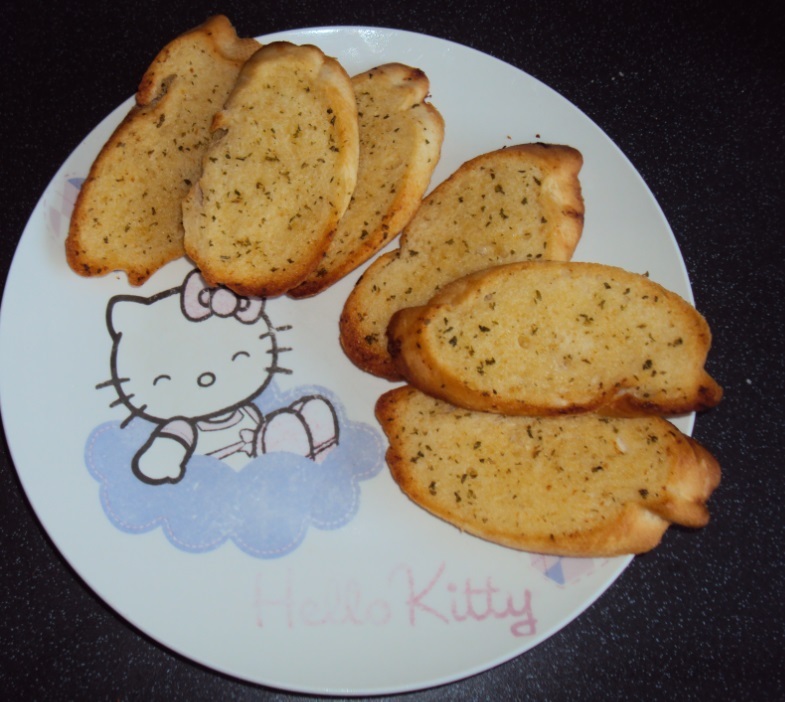 Lots of choice for garlic bread, but this one looks vegan friendly. I hope this little blog was useful – even though pizza is something people might associate with dairy – it is absolutely delicious vegan! I *love* The Hearth – it was an unexpected find, and if you can, I’d suggest you get down there and try it yourself! What are you experiences with pizza places? Comment below or add me on facebook and instagram – I’d love to hear from you! Thanks ever so much Katie for your lovely review! No problem! Thanks for stocking such yummy vegan cheese! I went again recently, so another happy review and lush photos to follow!!! ← Quick and Easy Vegan Mushroom Wellington Roast Dinner!